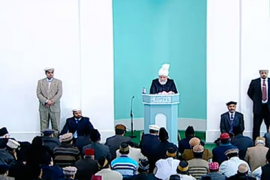 Today’s Friday sermon was delivered at Nusrat Jahan Mosque, Copenhagen, Denmark. Hazrat Khalifatul Masih said that his last visit to Denamrk was eleven years ago. Those who were little children at the time would be youth now and many among the youth of eleven years ago would now be parents. There are many blessings on the Jama’at in Denmark in the physical sense. They now have offices, hall and a library adjacent to the mosque. The house has been extended and now comprises of accommodation for missionary, guest house and a hall. All this is with God’s grace. If Ahmadi families have grown, their wealth has grown and the Jama’at has had growth in the physical sense it should certainly make everyone grateful. How could this gratefulness be demonstrated? We who have accepted the Imam of the age believe that we have accepted the one about whom the Holy Prophet (peace and blessings of Allah be on him) had said that he would bring faith back from the Pleiades. Therefore, we also have to make our thoughts in line with the thoughts of true believers and we should not be pleased merely to pay lip service to faith by uttering Alhamdolillah. We should self-reflect and see if we are putting God’s commandments in practice? Are we spending our lives like true believers as explained by the Holy Prophet (peace and blessings of Allah be on him) and as unfolded in this age by the Promised Messiah (on whom be peace). Hazrat Khalifatul Masih said during his visit to Denmark eleven years ago he had reminded the Ahmadis there, as he also often reminds in general and now with the facility and blessing from God of MTA Huzoor’s words now reach every Ahmadi providing they wish to listen, that God enabled them or their forefathers to accept Ahmadiyyat which was a very special blessing. It is very important that in order to continue this blessing and we develop in piety and improve our spiritual condition. Failing this, we should remember that if we stop in our tracks and disregard religious matters we will distant our next generation from faith and will deprive them of the special grace of God which the Holy Prophet (peace and blessings of Allah be on him) foretold. If our next generation becomes distant from Ahmadiyyat they will also be deprived of the blessings of the prayers of their forefathers who had accepted Ahmadiyyat. God certainly rewards piety and one’s children also benefit from this reward but God also states that one must also correct one’s practices. Our forefathers have departed from this world with the hope that their families would fulfil the pledge of bai’at. Many among the Ahmadis in Denmark should see if they are fulfilling pledge of bai’at in that spirit. It is needed to self-reflect whether the pledge of bai’at is being fulfilled for real or merely out of family and societal connections. Meanwhile, those who personally accepted Ahmadiyyat should self-reflect if they have tried to develop in faith or are trying to develop or was their acceptance borne of a temporary phase and they are standing still exactly where they were at the start! Those who have migrated to the developed world should see if economic success has taken them away from faith! With the grace of God many people who came to Denmark from Kosovo and eastern European countries have accepted Ahmadiyyat. They should be mindful that this is a great blessing of God on them that they have accepted the true devotee of the Holy Prophet (peace and blessings of Allah be on him). In short, all Ahmadis, be they born as Ahmadis or later accepted Ahmadiyyat, those who migrated or the natives [of Denmark] everyone needs to reflect that they need to try and practice the true teachings of Islam so that they may fulfil the obligation of taking bai’at of the true devotee of the Holy Prophet (peace and blessings of Allah be on him). Those born as Ahmadi, those who have been long-term Ahmadis or those who are new, every Ahmadi man and woman needs to self-reflect whether they are fulfilling the obligations of bai’at or are trying to do so. Are they trying to pay the dues of the responsibilities that the Promised Messiah (on whom be peace) expected of us or are they trying to mould their conditions according to his wishes and are bringing up their children in a manner which instils in them to give precedence to faith over worldly matters from the very start or are our own practices a role model for our children in accordance to the teachings of Islam, is our worship of God, each act of ours in accordance with the teachings of God and His Prophet (peace and blessings of Allah be on him)? Each person can find the answers to these by self-reflecting. And the Promised Messiah (on whom be peace) has guided us about these matters in great depth. The Promised Messiah said that in these turbulent times when misguidance, negligence and misdirection are rampant our Jama’at should adopt righteousness. God’s commandments are not held in greatness and there is no care about duties and advice given. People are too engrossed in the world and all that is worldly. Any minor worldly loss makes people abandon faith. This can be observed in court cases and matters of inheritance. Mutual dealings are based on greed and many show weakness when faced with selfish desires. They do not dare commit sin when they are in a state of weakness but as soon as some weakness is alleviated and there is a chance to commit sin, they get embroiled in it. No matter where you look these days, you will see that true righteousness is lost and true faith does not remain. However, since God does not will to ever waste the seed of true righteousness and faith, whenever He sees that the field is close to ruin, He prepares a new field! Hazrat Khalifatul Masih said if we reflect the above is not just an illustration of people at the time of the Promised Messiah, we see the same today. How many of us abide by the Word of God in our daily lives, leave the others, what about us who claim to have accepted the Promised Messiah! God Almighty says He created the men and the Jinn so that they may worship Him, do we sacrifice worldly matters for worship of God or is the opposite and we are sacrificing our worship of God for worldly matters? There are also those when they offer Salat on time they want to quickly offload themselves of it. This is quite separate from those who have not accepted the Promised Messiah. God Almighty says to deal with each other with kindness but there are many who, let alone be kind, usurp others. There are also those who cannot tolerate worldly loss but tolerate spiritual loss. There are many among us who cannot control their emotions and are inflamed at trivial matters. If the others did this we would say they were ignorant but if people among us are like this it is certainly regrettable. Thus everyone can self-reflect over these issues and we should always keep the Promised Messiah’s words in views that God Almighty wishes to create a new people who are living. In order to fulfil this we will have to pay attention to his words. The Promised Messiah (on whom be peace) said that when a person tries to look for the path of God Almighty merely borne of fear of God and prays for the resolution of this matter, in line with His law, i.e. ‘Andas for those who strive in Our path – We will surely guide them in Our ways…’ (29:70) God Almighty Himself holds the hand of such a person to show him the way and grants him inner peace. If one’s heart is full of wickedness and prayer is heavy on one’s tongue and one associates partners with God and is involved in incorrect innovations in religion how can one’s prayers and one’s seeking bring good results! Man is not worthy of God’s help and succour unless he only seeks from God Almighty with a clean heart and sincerity, having shut all unwarrantable ways and hopes. When he submits on the threshold of God Almighty alone and only prays to Him, he attracts God’s help and grace. God Almighty has sight of the inner recesses of man’s heart and if there is any wickedness, associating partner with God or any harmful innovation in any one of these recesses, the prayer and worship of such a person is thrown back at him. If God sees that a person’s heart is free from all sorts of selfish motives and wickedness, He opens doors of grace for him and taking the person under His wing He Himself takes on the responsibility of nurturing him. The Promised Messiah (on whom be peace) said that when a person demonstrates a great change in his attitude to his neighbour, it is as if he demonstrates a miracle. And this leaves a very good impact on the neighbour. There is criticism of our Jama’at…that its members cast aspersions and are given to outbursts of anger. Is it not embarrassing for them that they came to this movement thinking well of it. A good, pious son enhances his father’s good name. A person who takes bai’at is like a son, just as the wives of the Holy Prophet (peace and blessings of Allah be on him) are known as mothers of the faithful, as if the Holy Prophet (peace and blessings of Allah be on him) is the father of the believers. A biological father causes a child to be born in the world in the physical sense but a spiritual father causes one to go towards heaven and guides one to the real focal point. Would anyone like a son to cause notoriety for his father? Visit women of ill-repute and behave immorally, drink alcohol or commit other shameful acts which cause ignominy of his father? I know that no person would like this. However, when the prodigal son behaves so, tittle-tattle cannot be stopped and people associate such and such son to such and such father. Thus the prodigal son himself causes his father’s notoriety. Similarly when a person joins this movement and does not think of the glory and honour of the movement and behaves to the contrary, he is errant in the sight of God. Not only does he cause his own ruin but by giving a wrong example he also deprives others of the right and guided path. Seek help from God Almighty with as much strength as you have and try and removes your weaknesses with all your strength and courage. When you feel helpless raise your hands in prayer with truth and belief. Hands raised in prayer with humility, truth and belief are not returned empty. I say with experience that thousands of my prayers have been accepted and continue to be accepted. The Promised Messiah (on whom be peace) said this is also an age for spiritual warfare. War is on with Satan who is attacking the fortress of Islam with all his weaponry and scheming and wants to defeat Islam. However, God Almighty has established this movement to forever defeat Satan in his last war. Blessed are those who recognise it…Soon the time will come when God Almighty will illuminate the truth of this movement brighter than the sun. That will be a time when accepting faith will not be a cause of spiritual reward…Right now whoever accepts me has to fight a grand fight with his inner self. He will see that at times he will have to leave his family and efforts will be made to obstruct his worldly business and he will be verbally abused. He will put up with cursing but will be rewarded by God Almighty for all these things. But when the other era will come and the world will be as forcefully inclined to this movement as water falls from a high mount and when no denier would be found. What will be the worth of affirmation at such a time? Accepting at such a time will not be a courageous act…Hazrat Abu Bakr (may Allah be pleased with him) accepted the Holy Prophet (peace and blessings of Allah be on him) and gave up [the idea of] being a chief of Mecca but God Almighty granted him a great kingdom. Hazrat Umer (may Allah be pleased with him) also adopted humility and accepted the Holy Prophet (peace and blessings of Allah be on him) with a ‘what will be will be’ attitude and God Almighty did not withhold any part of reward due to him! If man makes even the slightest of efforts for God, he does not leave this world unless he is rewarded. The condition is to make effort. Hadith relates that when man walks towards God, God runs to him. Faith is believing in something that is unseen. A person who spots the crescent moon is considered eagled-eyed but a person who shouts at spotting a full moon is considered crazy. May we abide by God’s commandments and fulfil the rights of our bai’at. May we show the world the path to truth through our practice and may we be truly grateful to God for His favours on us!